Amazon On7 Prime Quiz Answers. Amazon is back again with a new quiz in the month of February. 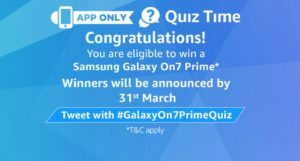 This time Amazon Samsung Galaxy On7 Prime Quiz is back and we added all the answers of this quiz. You have to answer 5 simple questions related to the specs of the Samsung On7 Prime Smartphone. We added all the answers of this quiz. So, check this post to know more. 2. 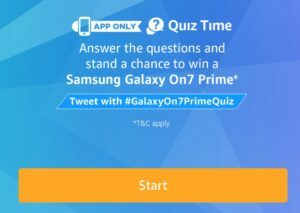 Open the app and you will see a banner about the Samsung On7 Prime Quiz. Click on it. 4 . 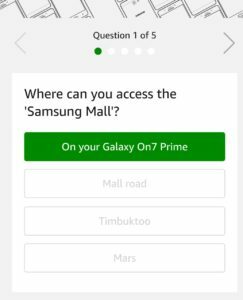 Start answering the questions of Samsung Galaxy On7 Prime Quiz. Q1 – Where can you access the ‘Samsung Mall’? Q2 – Which of these can you NOT do on Samsung Mall? Q3 – What are the RAM options available on the Galaxy On7 Prime? Q4 – What are the color variants available for the Galaxy On7 Prime? Q5 – The Samsung Galaxy On7 Prime comes with a 13MP (f1.9) primary camera and a __ MP front facing camera. Fill in the blanks. 5. After answering all 5 questions correctly, you will get a Congratulations message that you have been entered into a lucky draw. Now keep your fingers crossed and wait for the results to be announced by 28th February 2018. A total of 12 (Twelve) participants will be selected as winners of the Contest who answer all questions correctly. The declared winner(s) will be eligible for winning a Samsung Galaxy On7 Prime (4GB/64GB) device as a prize.